One year and a few months after the release of its debut album, Swedish Viking folk black metal band Feskarn from Uppsala is back with its second work, entitled “Östra Aros“. Feskarn is the personal project of Niklas Larsson, who formed this metal band in 2010 after his experiments with electronic stuff. He signed to the German label Pesttanz Klangschmiede and in the end of 2012 he released the debut album “Raise Your Swords“. 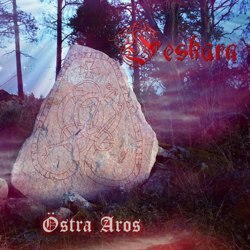 On the 1st of February 2014 his second full-length album “Östra Aros” was out, again via Pesttanz Klangschmiede. The new album continues in the same style Niklas introduced in his debut work. Black metal with raw over-distorted guitars, combined with very melodic synths that give an epic folk touch to his music. This time though, everything seems more balanced and solid, with a clearly improved production. Well, the production is improved and folk instruments sound more natural now, but the band’s overall sound still remains quite synthetic and extreme! There are several parts where the synths have an almost “midi” quality, reminding of old epic computer games. Is this bad? I don’t think so, since these games had wonderful music! Songs move in generally fast rhythms, but they often change to mid and slow tempo, something that adds more depth in the compositions. There is a bigger variety this time in the extreme screaming vocals, while the addition of “clean” Viking vocals made everything more interesting. “Östra Aros” includes 12 songs plus a funny / silly bonus track and the album lasts for 49 minutes totally. Feskarn manage to walk on a very thin line, balancing between a very extreme aggressive nature and a catchy soft melodic side! I am sure that some people will think that the balance is lost either on one or the other side, but it worked fine for me! Half of the lyrics are in English and the rest in Swedish, dealing with epic Viking thematology and drinking. After two albums, Feskarn has managed to build a distinctive and very personal sound, combining in a unique way raw black metal and epic synth-based music with few electronic touches. “Östra Aros“is released by Pesttanz Klangschmiede in a limited to 500 copies CD edition in standard jewel-case. It comes with a 12-page booklet including the lyrics, while album photos are taken by Madde.E, Abbe and Tyr.S. You can visit the band’s official Facebook profile for more info, or their label’s Bandcamp page, where you can listen to the complete album.